Book #4 is available for order. Well, I finally got the book, "Applying the Rules on an As-Needed Basis." I am very pleased with it and I love the bonus story featuring Miriam & Sherry in "Hollow E'en." The art is wonderful. I am still so envious of your drawing ability and the power to capture the many nuances of human facial expression so well. RCM, you are a true maverick of the caricature portrait of the human mind and its superfluous foibles. I don't know; I don't think they teach this well or even attempt to in art classes (of which I've many taken). I'd love to see the bonus story in color as well as all of the strips. I'd also love to see a graphic novel with all new content. It's a tall order, I know, because you have to make a living and cannot devote yourself full-time to your art. This is a problem for many creative people in the Universe. Talent oftentimes must take a backseat to the integral eccentricities of living, sometimes even disappearing completely. And then, maybe then, one rues that loss when old age convenes and renders its verdict of what you've done and not done, what you've imagined but only dreamt about. Art is the magical stuff of dreams and we live in an age when many people no longer believe in the possibilities. Too much useless war and too much repetitive political rhetoric seem to suffuse the world with an unforgiving angst which no philosopher nor talk show host can resolve or reduce in scope or gravity. At any rate, I believe that for every drop of rain that falls, a flower grows. I also believe and often sing that "I believe I can fly." Yes, I can touch the sky. I believe that one morning I will awake only to discover that I am a human-sized cockroach with magnificent super powers and the ability to eat as much as I want without consequence. I will appear dapper and dandy to all. I will be loved universally. Bloggers, editorial boards, diverse web commentators and critics will exempt me from the blows and arrows of their outrageous misinformation. Yes, all this - will be mine. Yes, this book, (again) "Applying the Rules on an As-Needed Basis," this book - will henceforth be my salvation, my rescue from a dire past and a monotonous present. It will deliver me from the snares and wiles of the guile who seek to render me mute and moot. Ahhh, I can feel it now - it is deliverance. I am now whole because of this book, yes, this book "Applying the Rules on an As-Need Basis." Say it aloud one and all - transform Mother Earth - causeth Her to beareth Fruit again. Simply read this book. Yes - It is what the World Needs Now along with Love Sweet Love. Respectfully and humbly, YVT - diddledop. Your flowery prose always overstates my contributions to the world by a factor of about 1000, diddledop. But I'm real glad you enjoyed the book, I hope you like the next one too. I await Book V. The book to end all books. The book where which shall the last book be printed. The Book that is the Book of all Books, the one and only true Book inspired by the Ultimate Great Booker of Books. After this Book sees print or electical illumination, then and only then shall I at last complete my last read book should I attempt to read it at all as opposed to merely enjoying its exclusively visual pleasures. I ask you this pointedly: When shall this great book of books see the light of day and the moon at night? Thank you muchly for attending suchly to this question of questions, perhaps the very question with which to end all questions. Thank you, Kind Author and Ingenious Creator of The Amazing and Astonishing World of Out There in this Here and Now, in this Age and in this Time, and indeed, within this Century or Eon or Era or Millenium such as the case may be. I submitted the book to Keenspot a little over a month ago. Typically when I get it to them that early it gives them enough time to have it printed in time for the San Diego Comic-Con (late July), but sometimes they get it done a little faster then that. I haven't followed up on it; I'm assuming it will be available for order real soon. Well, technically speaking, an Easter Egg is not exactly accurate. I mean a bonus story at the end of the book. I forgot to update the web site. Thanks for reminding me. Hope you enjoy the book. I finally got around to ordering Volume 6: The Apex of Sophistication! Looking forward to it - I hope there are some surprises. If not, that's okay. You keep doing books, I'll keep buying them until I die at that! Unless I have them shipped to my crypt afterward. We'll see. 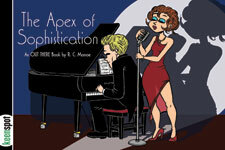 diddledop wrote: I finally got around to ordering Volume 6: The Apex of Sophistication! Looking forward to it - I hope there are some surprises. If not, that's okay. You keep doing books, I'll keep buying them until I die at that! Unless I have them shipped to my crypt afterward. We'll see. 50+ pages of extra stuff in the 6th Out There book. A steal at any price! At long last, Book VI was deposited by a uniformed man in my letterbox. I shall look forward to perusing and viewing its contents! Thank you. diddledop wrote: At long last, Book VI was deposited by a uniformed man in my letterbox. I shall look forward to perusing and viewing its contents! Thank you. You’re welcome. Thanks for your patience. I like Pom-pom Dreams. Biographical and intriguing. Screen Queen as well. Love the art and how you depicted the evening hour. Amazing. I think you are an exceptionally talented artist. You really ought to be a millionaire or more. I'd love to see what you would do if you could spend all your time creating art. Question: What would you draw beyond Out There? I mean not Out There. Could it be at all possible to publish a book of entirely new material outside of the web comic? Actually, my perfect dream for Out There would be an actual traditional in-hand comic book, perhaps a monthly publication? Wow! A collector's dream. A hundred Out There comic books! Just fantasizing a bit, that's all. I could do all of those things if I had unlimited time, which, of course, I don't. Stay tuned, though. New things are on the horizon!